Like humans, products and services also have a specific life cycle. We pass through different stages of life like infancy, childhood, adulthood and old age. 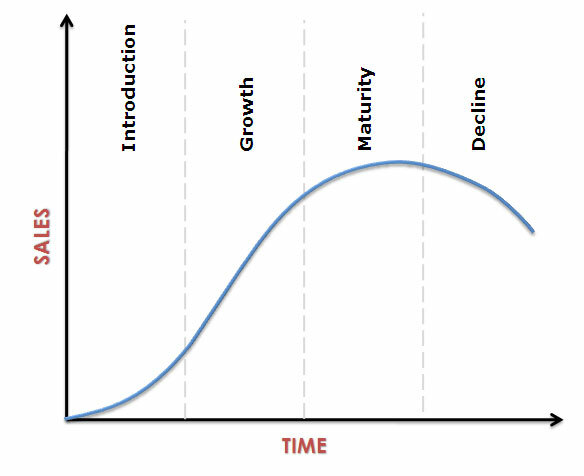 In a similar way, a product also passes through four stages; introduction, growth, maturity and decline. So the product life cycle is composed of these four stages. Companies have different strategies for different stages of product. In this stage, the product is launched in the target market segments. The emphasis is on increasing its awareness in the market that is achieved through intensive marketing and promotional activities. Two pricing strategies are usually opted in this stage, penetration pricing and skimming pricing. Penetration pricing is used if there are similar products in the market. You keep your prices low to penetrate into the market and capture a major market share. Skimming pricing is used if your product is new and unique. You keep prices high to recover the developmental costs and earn profit in shorter time, before the entry of competitors with similar products. Once the market has accepted your product and its demand starts increasing, the product enters the growth stage. Sales increases hence profit also increases. Now company's focus is on expanding its market by capturing new market segments. Accordingly, it designs its marketing and promotional activities and adds more variety in its product. At this stage, you have to face competition from other similar products. Your sale stabilizes or increases at a slower rate. So instead of focusing on increasing profits, the companies focus on defending market share and extending life cycle. When the sales drop and market becomes saturated with similar products, your product enters the decline stage. It may be due to competition, technical obsolescence and changed economic trends and customer preferences. At this stage, the company withdraws all its marketing and promotional support.